Authorities said Monday it is now safe for residents of a 1.5-mile evacuation zone around the Arkema plant to return. They were forced to leave Tuesday. 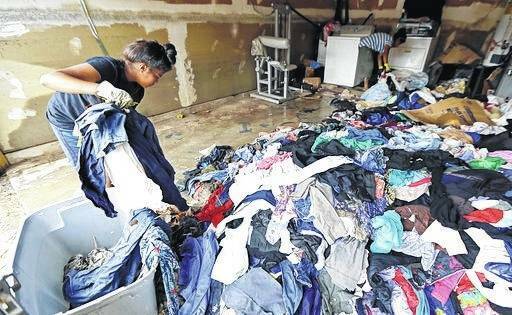 More than a week since the storm hit, the 4 feet of water in her parents’ home had receded just a foot, said Karen Mace. She was trying to retrieve family photos from the one-story ranch her parents built and have lived in for 56 years, which backs up to Buffalo Bayou. Meanwhile, repairs continued on the water treatment plant in Beaumont, about 85 miles from Houston, which failed after the swollen Neches River inundated the main intake system and backup pumps halted. And outside the town of Liberty, about 45 miles from Houston, dozens of people were still cut off by the swollen Trinity River. A Texas National Guard helicopter landed at the local fire department with pallets of drinking water. Afhley Lluvia, left, and her mother, Julia, remove clothing from their home which was destroyed by floodwaters in the aftermath of Hurricane Harvey on Monday in Houston.